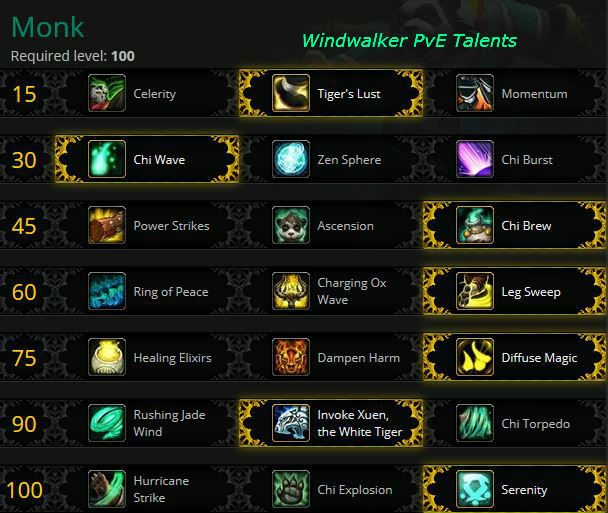 Windwalker Monks are a fine DPS class with very good A of E capability and pretty nice self-healing. Warlords of Draenor brought a lot of changes, check them out on our Monk changes post. Our Other Monk Guides: Mistweaver healing, Brewmaster tank, Monk leveling, WnadWalker PvP and WindWalker PvP Gear. Tier 1 offers us three mobility enhancing talents. Celerity is one of two options this tier that enhance roll and Chi Torpedo, increasing the limit of charges by 1 and reducing the cooldown time by a small amount. Tiger’s Lust gives us a speed increasing spell that can be cast on both ourselves and others. Best for PvP, and provides the least movement for raids and such, but provides reliable emergency movement that is not subject to the occasional snare or root. This is additional movement to your rolls, which can come in very handy at times. Momentum is a passive that causes our Roll and Chi Torpedo abilities to grant us a speed increase for a short time, stacking up to 2 times. The choice for this tier is largely preference based. Tiger’s Lust offers the greatest speed increase, but also has the shortest duration. The other two improve your consistent mobility, but can’t be cast on other players. Chi Wave is a basic chain heal type ability. It does a decent amount of healing, is a DPS add, and is the most generally useful ability in this tier at this time, especially when fighting one opponent. Zen Sphere summons a sphere that periodically heals the target and damages a nearby enemy. It falls behond the other to in healing and in damage. Chi Burst is best used with three or more targets and is the pick for groups. At lower levels of Haste go with Power Strikes, at high levels Ascension wins out. Chi Brew can help when loading up your Brew stacks and Chi for that next burst. Power Strikes causes our Jab to generate an additional 1 Chi once every 20 seconds. Power Strikes grants the greatest overall Chi generation, but Chi Brew is a competitive option, particularly for encounters that demand burst damage. Buffed in 5.4 to proc from more abilities. Ascension increases your maximum Chi by 1, and also increases your Energy regen. It works very well with Chi Explosion, if you take one then take the other. Chi Brew instantly restores all of our Chi and provides two stacks of Tigereye Brew and is the beter choice if you don’t take Chi Explosion. None of these are effective against bosses. Ring of Peace disorients the opposition (they will do less damage) and silences casters. Occasionally useful against some trash. Charging Ox Wave stuns all targets in its path up to 30 yards away. A decent option for stunning targets you need to catch up to. Leg Sweep stuns all enemies within a 5 yard radius. This is usually be the best choice for dealing with groups of trash mobs. Healing Elixirs adds a small heal to our use of Brew/Tea abilities. A useful healing ability if it triggers often, but it’s a DPS loss if you have to use it. Dampen Harm is fairly potent when you need to endure a damage spike. Use Diffuse Magic instead, if you’re looking at a lot of magic damage. Healing Elixir offers consistent healing, but is inferior to Dampen Harm and Diffuse Magic when dealing with heavy burst damage. Either of the two damage mitigation cooldowns is useful depending on the type of damage you’re taking. Rushing Jade Wind provides an AoE damage increase and replaces your Spinning Crane Kick. This is the pick for fighting groups. Invoke Xuen, the White Tiger provides optimal DPS in most situations and is the overall best choice at this time for single target fights. Chi Torpedo is inferior to the other two options at this time. Hurricane Strike: You unleash a rapid series of kicks to some enemies in the area and become immune to movement impairing and “loss of control” effects for 3 seconds. A nice burst talents, esp. for single target, but falls off as the groups get bigger. Chi Explosion provides escalating effects depending on how much Chi you spend: 1 Chi: damage an enemy; 2 Chi: additional damage as a 6 second DOT; 3 Chi: generate a charge of Tigereye Brew; 4 Chi: The damage hits all nearby enemies. This is the pick for fighting groups and it works very nicely with your Ascension talent. Serenity: 10 seconds of perfect serenity causes all Chi consumptions to be instantly refilled. 10 seconds of awesomeness on a 90 second cooldown. Glyphs, like talents, are easily changed depending on the situation. Grab any that look like they might be interesting. (See our gold pages if the price is a bit high.) There aren’t really any required glyphs, but there are several that are quite useful in particular situations. Once you know the fights you’ll be able to pick and choose as necessary. Glyph of Flying Fists – Increases the range of Fists of Fury by 5 yards. This will let your hit more targets or make sure a single target doesn’t move out of range. Glyph of the Floating Butterfly lets you ove while casting Fists, but it removes the stun. Since the stun doesn’t affect the boss anyway this probably doesn’t matter. Glyph of Touch of Karma – Now with New! Improved! 20 yd range! which make it a lot more useful. Glyph of Zen Meditation is handy if you use Zen Mediation regularly. It gives you an opportunity to move or reposition yourself. Glyph of Touch of Death – No chi cost, longer cooldown, nice for zapping adds or bosses with very low health. Glyph of Fortifying Brew – A bit more damage reduction at the cost of a bit less healing. Glyph of Paralysis – removed damage over time effects from the target, allowing your Paralysis to stick. Has the occasional use against adds. Glyph of Zen Flight – Fly about on a meditative cloud. Glyph of Water Roll – Roll over water. Glyph of Spirit Roll – get back to the raid a bit faster. Hit, Expertise, Reforging, Resilience, and PvP Power are all dead. You have two new secondary stats, Versatility and Multistrike. You get +5% of the latter from your level 90 Battle Trance ability. Multistrike gives you two chances at an additional attack/heal at 30% effect. Multistrikes can crit. Haste will give you faster energy regen, as well as casting. At some point you may find yourself capping your energy too often, which is not wasted energy. Crit scales well and syncs well with your various abilities. Mastery – generating addition Tigereye brew gives you additional opportunity for bursts. As mentioned at the top of the page this rotation assumes that you’re level 100. (well, you are raiding, right?) Just in case you still need to get leveled, go here. You should always use Stance of the Fierce Tiger. Jab is your default Chi building attack. Use Expel Harm when you’re able to benefit from the self-heal. The damage that Expel Harm deals is based off the amount you’re healed for, which is why it’s only practical to use when the healing is necessary. Use Rising Sun Kick on cooldown. This applies and maintains the debuff, increasing the damage your abilities deal to the target. Tiger Palm should be used as often as is necessary to maintain 3 stacks of the Tiger Power buff. Use Blackout Kick or Tiger Palm when Mastery: Combo Breaker triggers. Note that when the effect triggers you’ll be granted either a free Blackout Kick OR Tiger Palm not both or a choice of either one, meaning you’ll simply have to use whichever ability is available. Fists of Fury should be used on cooldown. Blackout Kick is a filler attack to expend excess Chi when not needed for other abilities. Against a small group of targets, continue your single target rotation. When facing 4 or more enemies, maintain the Rising Sun Kick debuff on all targets and use Spinning Crane Kick. Use Energizing Brew on cooldown so long as the energy generated won’t be wasted. Try to be below 35-40 energy when triggering this ability. Use Tigereye Brew when you have 10 stacks of the buff. You gain a stack of Tigereye Brew each time you expend 4 Chi. Touch of Death should be used as often as possible, although the damage window in which it’s available makes it difficult to use on bosses. Fortifying Brew is a decent survivability cooldown for when you’re taking heavy damage. Touch of Karma allows you to redirect all damage taken to your target for a short period of time, up to a maximum of damage equal to your total health. This acts as both a damage avoidance and DPS increase cooldown. While Zen Meditation doesn’t increase your damage, it can be used to great effect as a raid survivability/damage mitigation tool if necessary. Power Strikes is a passive increase to Chi generation. Chi Brew is best used as often as possible so long as you have 0 Chi and can therefore obtain full benefit. If an encounter demands burst damage at specific times or has phases in which you deal increased damage for a period of time, use it then for optimal effect. Ascension is a passive increase to maximum Chi. Rushing Jade Wind is best used for AoE damage. Invoke Xuen, the White Tiger should be cast as many times as possible for maximum DPS. The secondary gems have twice the value of primary gems (320 Haste Vs 160 Ag.) It’s worthwhile to match socket bonuses, especially if they are for Agility. If you want to match a socket bonus the you can use an Orange gem in a yellow slow, and purples in the blue slots. If you’re short on gold then see our guide. Your Leather bonus adds to any Ag. gem bonuses, making them worth 5% more Agility. That bonus does not add to other stats. Make sure you have your Hit and Expertise first, 7.5% each. Then gem for Haste until your energy regen is around 12.5. After that go for Crit. Some Hit/Exp gems are shown in case you need those last few points. Blue: Glinting Imperial Amethyst – If you need the hit, otherwise skip the bonus and put one of the other two (above) gems into the slot. Gem sockets have a (small) random chance to appear on Raid and other gear, they are not nearly as common as before. There are no meta gems or meta sockets, there are no socket bonuses, and all sockets are “prismatic,” which means that they will take any available gem. Older (Mists of Pandaria) gems work until item level 600, but the item squish cut them down a bit. What used to be 160 Ag is now 10, for example. The new Prismatic gems are 50 points of Mastery or whatever. Cogwheel Smooth Tinker’s Gear: 38 Crit – requires an engie helm, such as this. Short on gold to buy all your goodies? Most of the enchants below have similar enchants available, of lesser value, for less cash. Check with the rep vendor or the Auction House for these. If you want to buy the best enchants, fund all of your alts, donate to the guild, etc., but don’t have the cash, then see what the Tycoon Addon can do about about improving your situation. Warlords Notes: There are no head enchants, all shoulder enchants come from the Inscription profession and are only for items under items level 600. Only your Neck, Cloak, Weapons, and your Rings have Warlords’ enchants. Enchant Weapon – Glory of the Frostwolf: Sometimes procs 500 Multistrike for 6 seconds. Enchant Weapon – Mark of the Shattered Hand: Sometimes bleed your enemy for 6 seconds. Enchant Weapon – Dancing Steel: Sometimes add 103 Ag when striking. As with the rings, there are similar “breath of…” enchants which add +30 to the stat and will likely be much cheaper. There are similar “breath of…” enchants which add +30 to the stat and will likely be much cheaper. Living Steel Belt Buckle: put a nice gem into this slot. Enchant Boots – Blurred Speed: 10 Agility and Slight run speed increase. Note that Pandarens get twice the food buff. All food buffs last one hour. Any Agility bonuses also add to the food and chemical bonuses. Food buffs go away when killed, flasks do not. Your agility flask is better than any pair of elixirs. Virmen’s Bite: 456 Ag for 25 seconds. If you pop one immediately before combat you will be able to pop another during combat. Darkwater Potion: When 15 seconds of faster running/swimming might be useful. All of the profession bonuses have been removed in Warlords. No more extra sockets or Ag. buffs from profession perks. So what are they good for? Earning gold and/or making your own starting raid gear, of which you can equip only three crafted items at once time. Leatherworking gets you the 640 armor (upgradable to 665) and Inscription a staff (upgradable to 655.) The armor and weapons are expensive to buy and time consuming if you’re making them. They very expensive to upgrade. Tailoring Nothing here except a flying carpet. Leatherworking Armor for starting your raiding, make the upgrades. Jewelcrafting Make nice rings and neck items. Enchanting Enchants and disenchant stuff. Inscription Make glyphs, your staff, darkmoon cards (for a trinket,) and several other items. Alchemy Better living through chemistry, such as your flasks and elixirs. Engineering has lots of interesting toys, some of which have situational use. Rockets and shields and such aren’t usable in raids, though. Blacksmithing Nothing to see here, move along. Skinning For the gold, or to supply Leatherworking. Herbalism For the gold, or to supply Alchemy or Inscription. Mining For the gold, or to supply Blacksmithing or Engineering. In Warlords all racials that had Hit or Expertise are now dead. Worgen and Goblins are the only races which cannot become Monks. The most that any particular race will provide in term of DPS is maybe 1% overall, not enough to care a lot about. Still, if you want every bit of burning power for your flying kicks here’s how they stack up. Better buffs from food is a nice benefit. Rested XP lasts longer, for faster leveling. Melee range stun will have use on trash mobs and occasional bosses. Take less falling damage, but that probably more useful in PvP than in raids. +Versatility is a nice bonus. Stone form washes away some effects and reduces damage by 10%, which will have occasional use. +2% critical effect for damage and heals. 2% Dodge is a sometimes useful stat, but more for Brewmasters than you. Shadowmeld is perfect for those times when the opposition ignores the tank and comes running towards you. +1% Crit by day, +1% Haste by night. Expertise with swords is useful if those are the best weapons available. Your Escape will find occasional use. Blood Fury is very nice for those times when you need a bit of extra smash. Put it in a macro with your openers or other “it’s burst time” abilities/items. Berserk is very nice for those times when you need the burst. Increased XP from Vs beasts will be helpful vs some types of trash. Ranged weapon expertise is useless to you. The ability to remove fear and other effects is occasionally useful. Touch of the Grave is a small DPS add and also heals you for the same amount that it drains. Indefinite Underwater breathing might be of some use, somewhere. 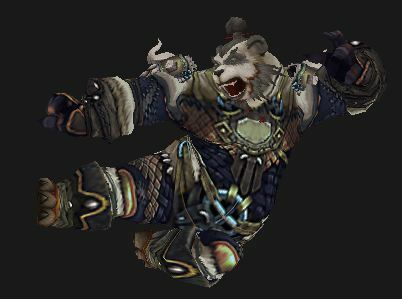 Tauren – My mind boggles at Taurens doing spinning kicks. Additional Stam doesn’t scale well at very high levels, but is still nice. War stomp will have definite use. Arcane Torrent will silence casters, which is situationally useful. Once upon a time, while leveling, you had to look up quest details on some website. There was no in-game help and you had to trundle along as best you could. That was when there were only 60 levels. Now we have the new(ish) Monk class, 100 levels, thousands of quests, and a bazillion mobs to kill. Whether or not you’re playing a Monk that’s a daunting task. Brand new to WoW? Decked head to toe in Heirlooms? Mixing up questing with PvP and/or dungeons? No problem, Dugi has your back all the way from level 1 to the level cap, or whichever level you start from. 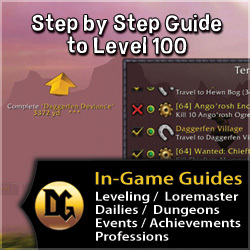 Dugi’s in-game guide is always quickly updated for all patches and expansions, so it’s never obsolete. Grab yours here and get leveled fast.